Ron and Tressa Cooper have been making marinades, jams, sauces and elixirs from 100%-natural ingredients (utilizing as many California-grown ingredients as possible) since 1997 in Loomis, CA. 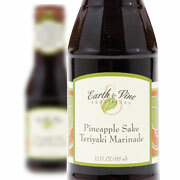 * Receive a free bottle of Earth & Vine’s Pineapple Sake Teriyaki Marinade with your purchase of any two Smart Chicken products during the month of September 2011 (while supplies last). Please come visit the following Nugget Markets locations for our Friday night wine and beer tasting events, 5pm - 7pm! Tastings are just $5/flight. Wine, Cheese, and Brew Festival - El Dorado Hills Firefighters Assn. Prices valid 9/7/2011 – 9/13/2011. We’re partnering with Smart Chicken and Chef Yakura to bring you some smart recipes, savings and a chance at an exclusive dinner party. 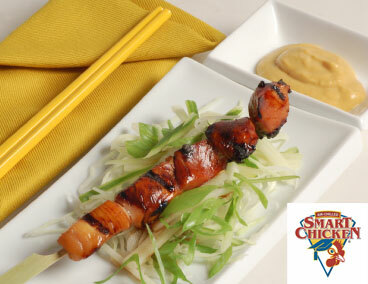 Skewers of grilled Smart Chicken breast tenders and boneless dark meat with a sweet tare glaze, ginger wasabi slaw and a spicy mustard dressing. Snag a seat to eat with celebrity chef Mike Yakura at Nugget Markets! On Saturday, October 15th, “Top Chef” guest judge and Ozumo’s corporate chef, Mike Yakura, will demonstrate his innovative and contemporary take on Asian cooking. Yakura has been at the helm of San Francisco’s Ozumo for the last 4 years and proudly crafts the cuisine of his family’s heritage. It was the influence of his 102-year-old grandmother and his Nisei (second generation Japanese-American) parents that inspired him to change his career in design and pursue professional culinary arts. Sample his original recipes at our exclusive dinner party. One lucky diner will also take home a nine-piece set of Le Creuset cookware ($715 value). 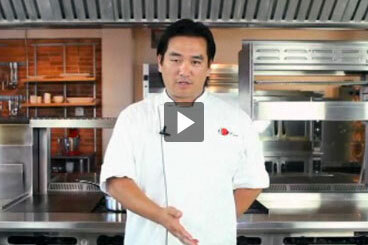 Enter to win a seat for you and a guest at our exclusive dinner with Chef Mike Yakura. Seats are limited — sign up today!